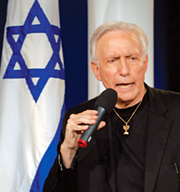 In 1977 Sid started a ministry called “Messianic Vision” and a nationally syndicated radio broadcast by the same name. But the Messianic Vision is more than a ministry or a program; it is a desire to reach out with the good news of the Messiah, “to the Jew first” (Romans 1:16). This is not just God’s historical order for spreading the gospel, but also His eternal spiritual order. When we follow this “law of evangelism,” God opens a supernatural door to reach Gentiles as well. God’s heart is to reach all people. His strategy is “to the Jew first.” this is a one new man ministry joining Jew and Gentile together.